Description: An aged brined curd cheese traditionally made with at least 70% sheep’s milk, along with either goat or cow’s milk. The Murray’s Cheese Handbook says, “The sheep’s milk delivers a round fattiness in the mouth that offsets the bright tanginess and salt of the brine in which it stews.” It is sometimes baked in pastries or cooked in omelets, but the most common way to eat Feta is on salad. Whenever I get a chance—and if I happen to have a little cash in my purse—I love stopping at the local Greek store to buy Feta Cheese. It comes in “salty” or “less-salty” versions (this is what the man behind the counter tells me), and I prefer the “less-salty.” The cheese man is quick on the trigger when it comes to chopping off too-generous chunks—more cheese than I actually ask for—but it’s cheaper than I think it should be and every crumb is eventually devoured. 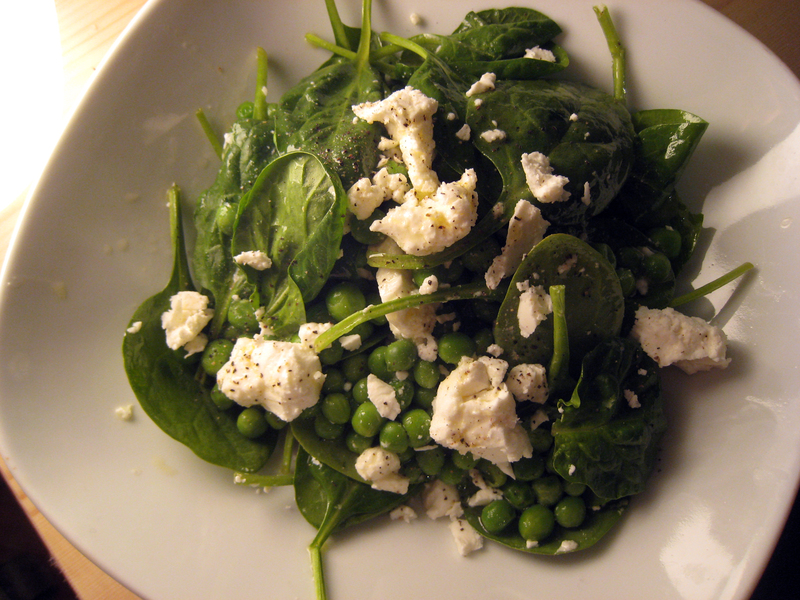 My favorite way to use extra Feta is in this simple salad that Geoff makes. It’s good with frozen peas, but we’re going to make an effort to track down fresh peas soon. 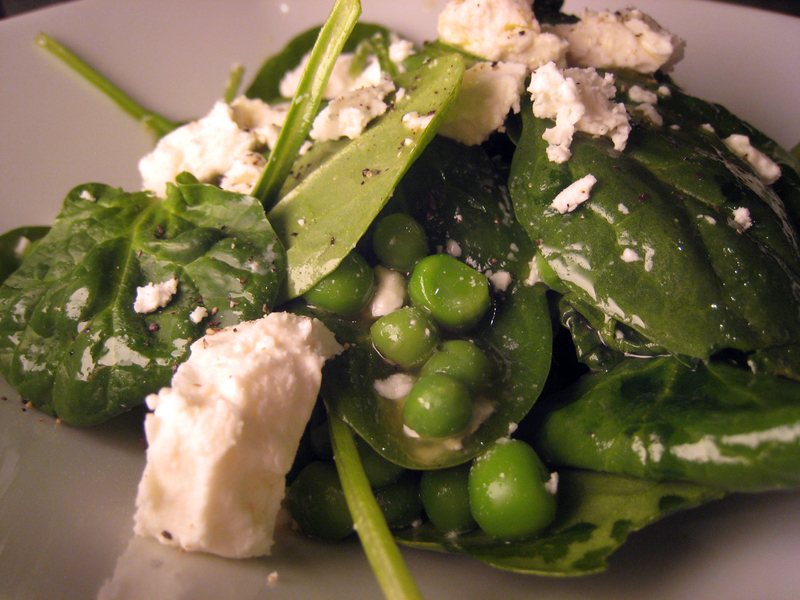 This is perfect pea salad season. Wash the baby spinach, and dry completely. Toss it into a salad bowl. Boil a pot of unsalted water and blanch your fresh or frozen peas, boiling fresh for about 3 minutes or frozen for just 1 minute. Drain in a colander and cool in a bowl of ice water. Then put them in the bowl with the spinach. For dressing, mix together the lemon juice, olive oil, salt and pepper. Pour dressing over salad just before serving, and crumble Feta cheese over the top. This sounds delightfully simple and tasty! That sounds absolutely delicious! Definitely bookmarking that for later. Nice site, Kirsten! I LOVE feta and often crave a big Greek salad!